A statue of Dennis Bergkamp is to be unveiled at Arsenal's Emirates Stadium to mark the Dutchman's contribution to the club. The striker was the most expensive foreign import to the Premier League when he joined the London side from Inter Milan for £7.5m in 1995. The sublimely skilled Netherlands international went on to score 120 goals in 423 appearances for Arsenal. "I am honoured that this is going to happen," Bergkamp said. In his 11 years with the Gunners, Bergkamp won seven major honours and was part of the unbeaten Invincibles side of 2003-04. "The statue of Dennis Bergkamp is still in its early construction phase and the unveiling is planned to take place before the start of next season," the club announced. Statues of Arsenal legends Herbert Chapman, Tony Adams and Thierry Henry already stand outside the stadium. 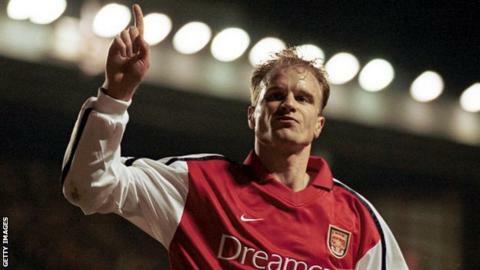 Bergkamp added: "It makes me very proud. Everyone knows that I love Arsenal and that I had a fantastic time at the club." Arsenal chief executive Ivan Gazidis said: "It will be a fitting tribute to Dennis's huge contribution to the club that a statue will be on display outside Emirates Stadium in the near future. "Dennis's quality and style of play will never be forgotten. He is a true legend of Arsenal Football Club."